The Action has a multidisciplinary research focus, represented by different working groups. The development of innovative diagnostic and control tools. 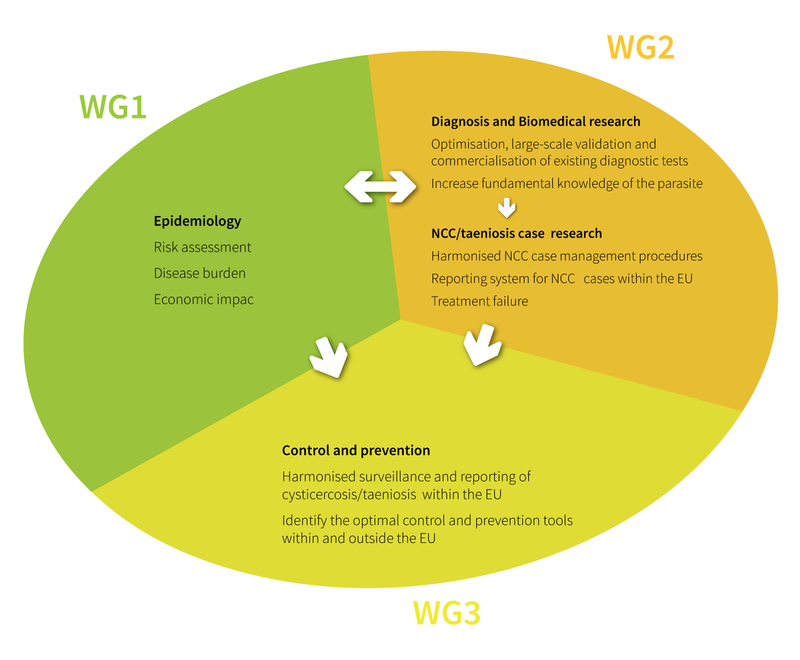 This will be done by knowledge and technology exchange between groups working on fundamental analyses of the parasite (such as proteomic analyses of excretion/secretion proteins, transcriptomics and genomics studies) and host parasite interactions; groups that have experience in the development of applied technology (all have been involved in the writing of this proposal); as well as private companies (Working Group 2, WG2). The assessment of the disease burdens and economic impacts. Essential for this objective is the gathering of all data on disease occurrence, its impact on human health, costs both on medical and veterinary levels. Models will be developed that estimate these burdens/impacts (Working Group 1, WG1). Inputs from WG2 will be needed. The optimisation and harmonisation of reporting/surveillance systems and patient management schemes for NCC. This will be carried out by WG3 (reporting/ surveillance) and 2 (case management) with inputs from WG1. The details are described under the respective Working Groups.